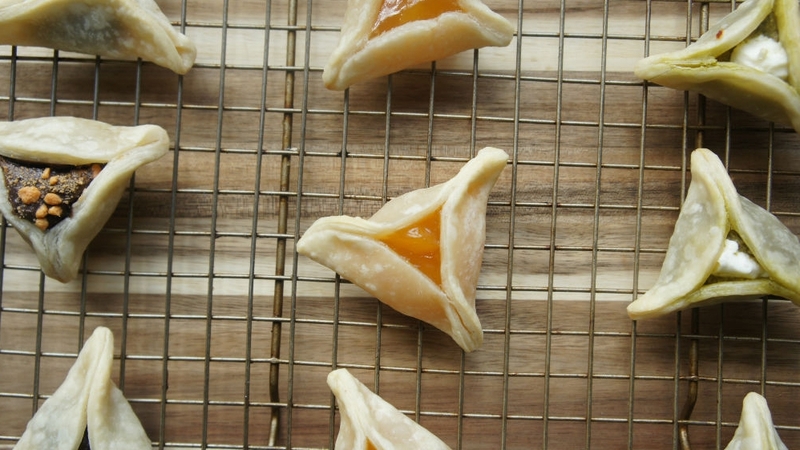 Supermarket pie crust takes the hassle out of these traditional Purim cookies. We know that hamantaschen can be tricky to master. The cookies explode, the dough is too crumbly, the list goes on. So if you don’t feel like going through the hassle of making dough from scratch, just go to the supermarket and pick up some prepared pie crust. Yes, that’s right – pie crust. Then use your favorite fillings like nutella, jam or even savory flavors like pesto and cheese. Watch me and my crazy kids make hamataschen or read below for the full instructions. And if you do want to try making hamantaschen from scratch, try one of my favorite recipes for cookie butter and dark chocolate hamantaschen. Using a 2 or 3 inch round cookie cutter, cut hamantaschen circles. Fill the middle of each circle with 1/4 tsp filling of your choice. Brush edges of lightly with egg wash using your finger or a pastry brush. Pinch up the sides of each hamantaschen.